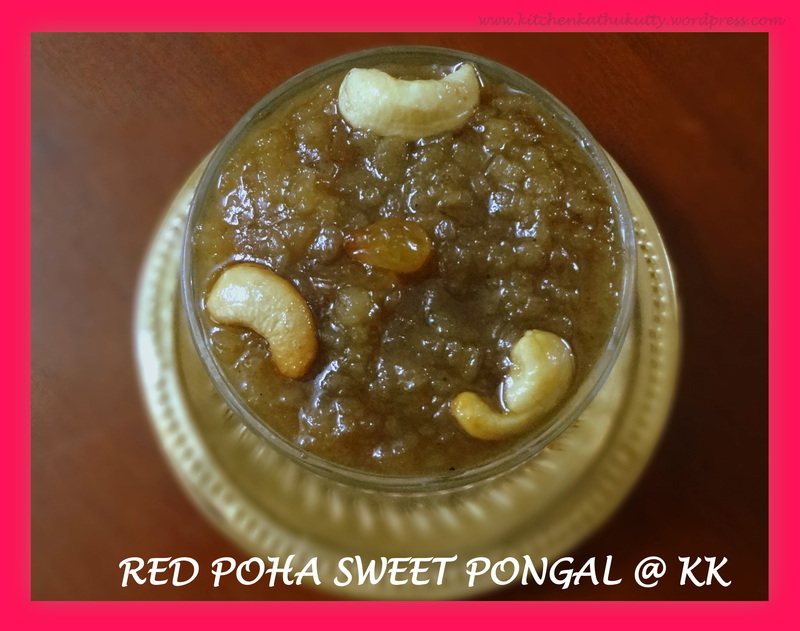 RED POHA SWEET PONGAL|AVAL PONGAL RECIPE|POHA HALWA RECIPE- Poha/flattened rice/beaten rice/aval is an excellent food options loaded with iron and Vitamin B. It is one of the world’s first fast food and my mother makes a variety of dishes ranging from a rich breakfast to a simple chatpata snack in jiffy. Red poha is made from brown rice and it is more beneficial as the bran is not removed. Poha is one of the healthiest baby food options and it helps in healthy weight gain for babies. Here is a sweet festive recipe which can be your baby’s meal or guest sweet/dessert or festive recipe or quick snack to munch on. Add a spoon of ghee in a pan and roast the dry fruits and set them aside. 2. In the same pan add the poha and roast it well. 3. Boil some water(I used two cups of water) and add the roasted poha to it. 4. In the meantime dissolve jaggery in water and strain the impurities. 5. When the poha is 90% cooked add the strained jaggery water to poha and stir well. 6. Add the remaining ghee and keep stirring till it thickens. 7. Serve it hot after adding the roasted dry fruits. The colour depends on jaggery used. You can use normal white poha too. Add water depending on the variety of poha. Add water to jaggery to just dissolve it. Do add more water. Add the jaggery mixed water after you ensure that the poha is cooked well. The water requirement for cooking red poha is little more than white poha. While offering babies less than one year you can use dates syrup to sweeten. It is better to avoid jaggery. Always have a word with your doctor before introducing any new food and do consider family history of allergies. You can also cook this like kheer/payasam in a flowing constitency. Or you can add coconut milk to this and make it a kheer or payasam. To speed up the cooking you powder the roasted poha and then cook. I avoid adding milk to poha fearing the combination of iron and calcium.